Dierdre and Wayne were such a pleasure to work with. Since her event was an intimate one, she wanted to splurge a bit. She wanted the pocketfold incorporated in her invite, all metallic paper and even chose one textured paper as well. 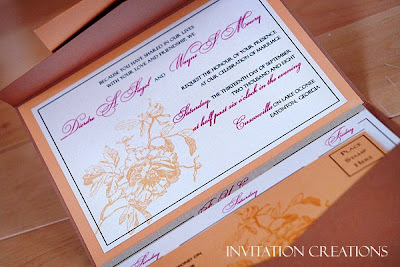 She loves flowers and had her heart set on having a large floral graphic on her invitation. She knew she wanted touches of vivid pink and a champagne color which was the burnt sugar paper. The photo (I need to work on my photo skills) does not do the burnt sugar justice. It truly is a beautiful color. She wanted her wedding event to be a weekend affair for a group of 40. We created an itinerary insert in her wedding package to inform and entice her guests of the three day events they had planned for the wedding weekend. Then we tied it all up with a golden ribbon (not shown).